Turkey burgers have a bad rap for being dry and tasteless. 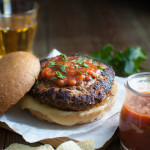 I’m here to challenge that notion with this recipe for salsa turkey burgers. Mixing some salsa in with the ground turkey keeps the burgers juicy and adds a tasty southwest flair. Cilantro, shallots and a little hot sauce just keep packing on the flavors. I also think it’s important to cook the burgers on fairly high heat so you get some nice char for texture and more flavor. You don’t even need to have a grill to achieve that. I used a heavy non-stick skillet and got some beautiful char. The key is to not be tempted to flip the burgers too soon or move them around too much. You want to let the burgers cook without moving until the undersides are dark brown and crusted. Just as important as the burgers are the toppings. I wanted to go beyond the old stand by of mayo and catsup and decided to embrace the southwest theme with some guacamole, pico de gallo, and melted Asadero cheese. And I have no regrets. Quick, easy, and healthy-ish – you can’t ask for much more from a weeknight meal. Your favorite hamburger toppings such as salsa, lettuce, tomato, guacamole, red onions, pice de gallo, cheese, etc. Stir together salsa, shallots, cilantro, oil, hot sauce, cumin, salt, and pepper in a large bowl. Add ground turkey and mix together until evenly combined. Using your hands, shape turkey mixture into four equal sized patties. Heat 2 tablespoons oil in a large nonstick skillet over high heat. Add burgers and cook until underside is brown and nicely charred, 4-5 minutes. Turn burgers over and cook until second side is brown and burgers are cooked through, 4-5 minutes more. Serve burgers on buns with your favorite toppings. Recipe adapted from Bon Appétit, August 2004.